One of the key ideas I push on Head for Points is that transferable, or convertible, points are better than non-transferable points. The best way to explain this is via American Express Membership Rewards points, earned from Amex Gold, Amex Platinum and the Amex Rewards Credit Card. You can transfer 1 American Express Membership Rewards point into 1 Avios. You might think, therefore, that 1 Amex point is worth the same as 1 Avios. IT ISN’T. 1 American Express Membership Rewards points is worth MORE than 1 Avios. This is because, as well as converting to 1 Avios, it will also convert into 1 Virgin mile, 1 Etihad mile, 1 Flying Blue mile, 2 Hilton points, 1.5 Marriott points, 3 Radisson points, 0.5p of shopping vouchers, 0.45p of statement credit etc etc. As well as giving you more choice, transferable points are also defensive. Even if you intend to convert your Amex points to Avios, it makes sense to keep them with Amex until the last minute. If you move them to Avios and BA moves the goal posts in terms of points needed or availability then you’re stuffed. So …. convertible points are worth more than non-convertible points. However ….. INSTANTLY convertible points are worth more than all other convertible points. One – sensible – argument against not converting your points until you need them is that the transfer takes time. Even transfers which are quick, such as American Express transfers to Avios, still require you to wait overnight. It is possible that the redemption seat you wanted may have gone when they arrive. Some American Express Membership Rewards partners have INSTANT transfers, however. The only caveat is that you need to have already linked your accounts. This is your dream result. You can look for the seat you want and, when you find it, move the points and immediately book without any risk of losing the seat. There are no HSBC Premier, Tesco Clubcard or Heathrow Rewards miles partners which allow instant transfers. This is a unique Amex feature. Which American Express partners offer INSTANT transfers? The reason I thought I’d write this article is that I just made such a redemption. I was looking for an interesting way to get to the Middle East which I haven’t written about before. I thought Air France was worth a look as you will soon be able to redeem Virgin Flying Club miles on Air France. Flying Blue, Air France’s own frequent flyer scheme, is also an American Express partner but does not offer immediate transfers. 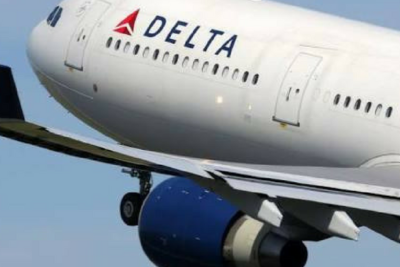 As both Delta and Air France are members of the SkyTeam alliance, however, I could book the same seat via Delta SkyMiles with an immediate transfer. This is how easy it was. Stage 1 was to find the flight on the Delta website (click to enlarge). Note – in the top right hand corner – that I have a zero mileage balance. Amex tells you to wait 30 minutes. 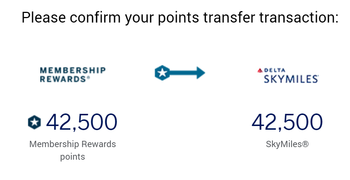 In reality, if you log out of your Delta account and log back in again, the points will be there immediately. I completed my booking and my seat was sorted. Even if transfers to Flying Blue were instantaneous, booking via Delta would still have been a better deal than using KLM’s own programme. My flight would have needed 45,000 Flying Blue miles compared with 42,500 Delta SkyMiles and the taxes were the same. Transferable points, such as American Express Membership Rewards and HSBC Premier points, are more valuable than non-transferable points. The most valuable points of all, however, are those that transfer instantly. PS. Whilst 42,500 Delta SkyMiles is a better deal to Dubai than 50,000 – 60,000 Avios, it is worth a reminder that this is NOT the best deal to the Middle East. I booked it because I wanted to try Air France. The best option is to transfer 25,000 Amex points to the Singapore Airlines KrisFlyer scheme which is all you need for a one-way Business Class flight from the UK to the Middle East. As a Star Alliance partner you’d be flying SWISS, Lufthansa or Turkish. Agree on optionality having value. And agree on points having instant transfers being more valuable, but only if you plan to transfer them to an available partner. I called reservations twice now and no availability is showing, does anyone know if they black out August for redemption’s? They had availability for September which seem strange. Really worried as we need to convert quite a few and its integral to our trip budget that we use miles, eeeek. Any experience booking this at peak is appreciated. August isn’t peak season for Thailand. It’s low season as its rainy season. Air Asia option is a good idea though. Agreed – but August is still a busier month though with Europeans and Americans coming in “their” summer & various public holidays around Asia. Koh Samui peak time includes August (Nov-Feb is off peak). Thailand has two monsoons which impacts the east and west side differently due to their direction . West coast areas such as Phuket, Krabi etc are off peak in August. Agree with Sam. The bus/sea ticket is ideal, unless short of time. Great views, and interesting way to travel, chatting to the locals etc. And very good if on a budget. The air Asia option, will coast you an extra £12 to £24 pp for a bag pp each way. But equally a good option. We use air Asia frequently within Asia for short hops. And minimal rain, so less risk of storms. Presumably if you are using VS miles for this then you need to book via Virgin? I’ve found VS system hit and miss with displaying Delta options. Booking via virgin miles also has more expensive tax? There’s also a similar case for keeping a healthy minimum base balance in your regular schemes, eg 50k in BA & VS, etc. Never know when a same day airport upgrade opportunity could come up. TripRep, did you comment some time ago about a same day upgrade on virgin from NY to London? I’m interested in doing the same in April if you have any further details such as miles required, taxes, etc. Ahop – See my other reply.. I have a few thousand Amex points which I need to move as I want to close the card and churn. What’s the best place to move them when I have no immediate travel plans? I collect avios, Virgin, and Ihg and also have Hilton, Delta and Emirates accounts with small balances. Depends on what you’ll use them for in the end, and what your balances are like in each programme. Personally I’d move them to BA, as I know I’ll need a one way 4,500 Avios flight at some point, and that’s part of the way there, but ymmv. DL and EK I don’t know enough about, but particularly with EK, if you don’t have a balance already, a few thousand won’t do a lot for you (although you can transfer them to Heathrow rewards and on to shopping vouchers, but not air miles, from there). Hilton is 1:2, as in 1x MR to 2x HH, I got it the wrong way round. Indicative value I stand by though! Fair point. I’ve just checked an upcoming reservation I’ve got, £191.79 at current exchange rate and I booked it for 50k HH, 0.384p/point. That’s advance purchase, I had it booked flex before I moved it to points, so the value was actually higher, and is a true saving as I was planning to pay cash, so you’re probably closer at current exchange rates! Agreed on 0.4p / point. It’s strange how HH points seem to have gone from 0.3p to 0.4p while IHG points seem to have gone from 0.5p to 0.4p. Genghis – I have recently booked 4 nights in an HIE in Lake Buena Vista for 80,000 IHG points. Cash price was $730 for the 4 nights. At current exchange rates that works out to 0.7p per point – so I guess it depends where you use them. Thanks very much for this. I’d assumed avios but it felt like a “default” choice and I just wanted to check I wasn’t missing anything. Probably virgin. You maintain a bit of option value since you can also convert to Hilton & ihg. Did someone say incoming Virgin points to IHG no longer count for IHG status? Correct, as of last May. Can a Platinum cardholder apply for this card and get 10000 MR points for spending £1000 as shown in above link? No mention of 6 months rule there anywhere. More importantly can this somehow be referred from an existing Amex Platinum card? The 10,000 Membership Rewards bonus points will be awarded onto your Account once you have been approved and you have spent and charged £1,000 within the first three months of Cardmembership. All introductory offers are subject to change, can be withdrawn at any time and are not available if you currently hold or have held any other Membership Rewards enrolled American Express Cards in the past six months. Please note that it can take up to one month for bonus points to be awarded to your Account. You can’t refer to this card, or refer from it. Agree, best used in premium cabins, or as an emergency last minute Y seat, if needed. Interesting – I find it a great redemption. Often using a Lloyds voucher so only costs me PE level Avios but still value the fully flat bed. For return flight I normally get 5-6h sleep so arrive in the UK in the morning pretty well rested. Shower in arrivals lounge to fully wake up before the connection back to EDI. For me it’s worth the Avios cost, agree cash outlay similar but I don’t view it as a free ticket more just Avios as an upgrade instrument! +1, we love our CW redemption trips to the Eastern USA, 240,000 avios for 3 of us using a 2 4 1 at peak time, plenty of availability even in the school holidays and a thoroughly enjoyable start and end to our holiday. Even if we don’t have to do a full day’s work when we return we arrive massively more rested and refreshed than we would have done crammed into economy. It’s absolutely the icing on the cake of our trips! It’s lovely that you’re so enthusiastic @Anna! I would like to meet you at one of Rob’s events if we ever get another one… hint! summer party? Amex OT: I have the BA Amex with 2 x 241 currently in the account (which I’ll actually be a little hard-pushed to use “usefully”). Am I right in thinking that this card has nothing to do with the Amex Plantinum? i.e. no point in asking for any special Plat joining offers for having been a good user/payer of the BA Amex? You’re right it has nothing to do with the Plat card but that is a good thing for you. You can refer yourself for the Plat card from your BA account and bag 9k Avios (assuming you have the Premium Plus BA card and not the free one – I think its 5k or 3k Avios from the free one) and an extra bunch of MR points on top of the normal intro bonus of 30k MR points for spending £2k in the first three months. I have an Amex Gold card earning 1 Avois per Pound and a BA Premier Plus card earning 1.5 Avios per Pound. I had thought the latter, despite the higher annual fee, was better value and intended to close the Gold card now that the annual fee has just kicked in, but in view of Rob’s article when I reach 10k spending on the BAPP and secure the companion voucher it sounds like I should close the BAPP instead and spend on the Gold card. I’d welcome any comments in case I’m missing something! Once you’ve spent £10k on the BAPP, try to spend on something else to hit another sign up bonus and cancel your BAPP to get a lot of the fee back. Assuming no sign up bonus, for ongoing spend, which card is the best depends on how much you spend, how quickly, appetite for paying fees etc. Ditching the BAPP after the £10k spend is good – wait six months and then you can get it again, together with the intro bonuses and another 241 when you spend another £10k. If you’ve hit the spending targets and collected the bonsues on the Gold you could churn that too, but you’d have to go to SPG if you want more sign up bonuses since you’ve had an Avios and MR card in the last six months. If you do this, don’t forget to refer yourself from the Gold to the SPG before closing the Gold so you can get referral bonus on the Gold and increased sign up bonus on the SPG. I am in a simialr situation to Lawrence. I have hit the £10k on my BAPP and am looking to cancel. Just to check – do I keep the 241 voucher or is that impacted by the closure? Comes up all the time, see previous articles. Amex will say you need to keep a BA card open for voucher. You don’t. Once voucher is safely in your BAEC account you can close BA Amex. You just need to have an Amex, ANY Amex to book with it. Can the Singapore airlines redemption to the Middle East include a stopover and if so is their a maximum duration? Although given how poor Frankfurt have been recently you might have an enforced stopover there if trying to transit! My understanding is stopovers are available on both saver awards and the normal ones (name ???). It will cost you 100 gbp for a saver award stopover whilst the other, full price redemption is free. May be able to book it all online. Dunno. I think that’s US$100 rather than £100. Also if you are doing a round trip, you can have a free stopover on a saver ticket. I agree. Took 2 days for Avios transfer BUT amazingly a return BA Club to Durban in Sept was still available to book on 241. You can be lucky but it is soo stressful waiting. Ahop – it’s was MCO-MAN just after Xmas, ground staff and aircrew were awesome. Was it a cash ticket or redemption ticket to start with? OT: I’ve just churned the Starwood Amex, but I don’t see the sign-up bonus in my Amex account – usually there is a graphic to show the target spend. My previous SPG card/account was closed 13-Jun, so it’s definitely been six months. Is it worth calling Amex to query whether they have awarded the bonus? I wouldn’t worry about it, the spend trackers tend to come and go. Give it a few days and it should be back! Ive just done the same. Never had a progress bar. Spent exactly £1,000 and now showing 36,000 Starwood points ready to move over at end of month…. Thanks all – I suppose there’s only one real way to find out! One thing you never explicitly mention about Amex points, but which I find extremely useful: they’re the easiest way way of keeping hotel balances alive for programmes where I don’t stay frequently. Much easier than mattress runs! Agreed, I sent 3x MR points to Radisson a few months back for exactly this! I sent some Amex MR to KrisFlyer at 5pm for a redemption to oz, and was surprised that the points posted by midday the next day.